Somewhere in Chicago there’s a personal tiki bar on wheels. I’m not talking about the rental “cycle pubs” popular in cities and hipster burgs. This is a five-top cocktail table under a thatched roof, hitched to a bicycle. It passed me around midnight on the streets of Chicago’s South Loop a few years ago. Everyone at the “bar” took a turn on the bike while the rest of the pack chilled on tall stools, nursing longnecks. These spectacles are part of the reason I love Chicago’s L.A.T.E. Ride. The 25th annual event starts around midnight on June 30 this year from downtown’s Grant Park, and it’s not restricted to extreme thrill-seekers or serious cyclists. Around 8,000 bike riders of all levels (honestly, all levels – I’m living proof) show up to pedal through the city en masse. Most people come on a regular bike and wear everyday workout clothes, but the freaks and weirdos can’t resist the big audience and the slightly nuts wee-hours concept. Thank goodness. It wouldn’t be any fun without them. Late-night bike rides haven’t caught on like mud runs, but that’s a good thing. Rather than corporate-branded productions with dates in 45 cities, they’re organized locally and reflect the community. Such rides tend to fall into one of two categories: the nonprofit annual fundraiser on a closed course (meaning police block traffic on most streets along the route), and the unofficial weekly or monthly group ride alongside cars, organized by the area biking community. The first type will carry an entry fee, but there’s more support and festivities, and the route appeals to out-of-towners. The second type will probably be free and might have grown into an established, well-attended ride promising safety in numbers, though the starting point and route might not be as visitor-friendly. Either way, they tend to be well organized, somewhat of a workout but not too much and very safe. Logistically, out-of-towners only have to worry about getting a bike to a ride that starts around bedtime and finishes around closing time. Most events don’t offer bike rental. You either have to drive to the event with your own bike, fly with one or rent one on your own once you arrive (and most bike rentals are priced for an hour or half-day of sightseeing, not overnight keepage). For the trouble, you get to ride in mild after-dark temperatures, see part of a city from an unusual perspective and do something kind of nutty. Spectators sit in bars and front yards along the route and cheer you on. Riders are hyped up on Red Bull to stay awake and inexplicably wearing Halloween costumes. Plus: free glow-in-the-dark T-shirts! When we think of Colonial America, we generally think of the old parts of Boston, lovely New England port towns such as Marblehead, or Spanish colonial towns such as St. Augustine. America’s heartland has some colonial traces too. The best preserved and most distinct is the French colonial town of Ste. Genevieve, Missouri. The French were mostly from Canada and copied the architecture they were familiar with. Single-story houses had walls of vertical logs set into the earth and plastered in a style called poteaux-en-terre. A roof of wooden shingles extended past the walls to bring rain away from the house and a covered porch often ran all the way around the house. Each lot was surrounded by a palisade of vertical logs to keep out the animals that strayed unattended around town. The tops of the logs were sharpened to keep out unwanted two-legged visitors as well. Inside each of these little forts was a yard, garden, barn and an outside kitchen, placed there to reduce the chance of a fire inside the house. Ste. Genevieve did well as the center for the fur trade and many local farmers made extra income mining for lead and salt. When the region was sold to the United States as part of the Louisiana Purchase it kept its French character. Even as recently as a hundred years ago some residents spoke French in the home. As well as keeping their culture they preserved many of their distinctive colonial houses. While you won’t see buckskin-clad trappers hauling their loads of furs onto shore from canoes, or French farmers heading out into the uninhabited woods with a flintlock over their shoulder in search of meat for the pot, Ste. Genevieve retains a strong historic feel. Many of the original 18th-century homes are open as museums and are stocked with period furniture. Ste. 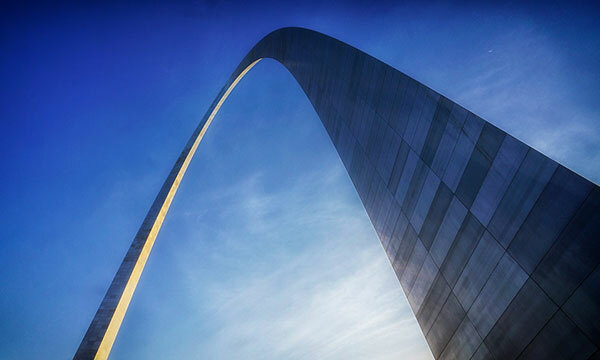 Genevieve makes a good day trip from St. Louis, and an even better overnight. Several 19th century homes have been turned into bed-and-breakfasts and the shopping district is well stocked with antiques and gift items. Being a regional attraction means the town keeps a full events calendar, including occasional reenactments, so you might just get to see those French trappers and hunters after all. Who could resist trying a pizza fit for the President of the United States? Last week, I visited a friend in St. Louis and he mentioned that President Obama offended some in his adopted hometown of Chicago a few years ago by choosing a St. Louis pizzeria called Pi to cater a pizza party at the White House, after having tried and liked their pizza at a campaign event at the St. Louis Arch. Any pizzeria worthy of the President’s admiration is one I want to try, but I was just in Italy for five weeks earlier this year and ate at Da Michele, a pizzeria that many consider to be the best in the world. The pizza at Da Michele is otherworldly and cheap too, so I was skeptical that Pi could measure up but was still eager to give it a shot. We met at Pi’s Washington Avenue branch, which is in a stunning, high-ceilinged building in downtown St. Louis. My friend and I decided to split a large, thin-crust Central West End pizza, which comes with mozzarella, prosciutto, goat cheese, cherry tomatoes, red onions, and a mountain of arugula.Pi’s thin-crust pizza has very tasty, super thin, almost crispy crust that I found to be outstanding. All of the ingredients were first-rate and the pizza melted in my mouth. For my taste, there was too much arugula and not enough prosciutto, but that’s splitting hairs. My only complaint about this pizza is the portion and the price, $21. With crust this thin, I could practically eat the large by myself. I had four good-sized slices – half the pie – but I wasn’t full. It’s more than a little unfair to compare a pizza with a slew of toppings in St. Louis to a cheese pizza in Italy, but I’m going to do so anyways. At Da Michele, the large cheese pizza is just over $6 and is so good you want to get a job at the place, or, better yet, move in upstairs to benefit from the aroma. Over the last decade or so, the gourmet pizza craze has hit every good-sized city in the U.S. to the point that you can get really good, wood-fire pizza fairly easily. But the prices can be ridiculous. In Italy, pizza is never expensive – never. And it shouldn’t be here either. Shakespeare’s is located right next to the University of Missouri’s main campus in downtown Columbia and the unpretentious vibe couldn’t be more of a contrast to the sleek, trendy interior at Pi’s downtown location. We sat underneath a large sign advertising “Liquor, Guns & Ammo,” and I fell in love with the place after having a look at their homemade food pyramid, which values pizza, candy and my other favorite foods above broccoli and fruit. We ordered a large sausage pizza and it was tasty, huge and cheap at $15.50. The circumference of the pizza was probably similar to the one at Pi, but the crust was more substantial and filling. That said, I thought that the pizza at Pi was a lot tastier. I ate every morsel of the crust at Pi, but the crust at Shakespeare’s was flavorless. Verdict: Pi wins the Battle of Missouri for my taste, but even pizza fit for the President should cost less. Note: Pi now has a location in D.C. as well.